Spring is a time of cleaning the house and giving it a new and fresh feeling. Last weekend I was on the market and started to buy flowers for the balcony. I love to create there my small little garden to take the breakfast in the morning surrounded by nature. When I was thinking of flowers than the house of Claude Monet in Giverny came to my mind. If you once travel from Paris to Normandie than you have to make a stop there. It is just amazing. Claude Monet (15.11.1840 - 5.12.1926) was one of the founders of the Impressionism. Impressionism was a lot about expressing one's perception before nature, applied to plein-air landscape painting. He had the ambition to document the French countryside. For this he adapted his way of painting to capture the changing of light. You can translate his ideas, his work in a fresh color harmony with different green tones. White high lights and some fresh yellow touches. Add flower bouquets in the house to bring nature inside. Play with color touches. Get out in nature and bring that what relaxes you inside your home. In 1883 Monet moved to a house in Giverny, there was a barn that doubled as a painting studio, orchards and a small garden. After he has rented it for a few years he purchased it finally in 1890. In 1893 he began landscaping the garden, of almost two acres, which he now owned, building a second studio and a greenhouse. The lily ponds will become one of his best-known subject for his paintings. He began painting the water lilies in 1899 and later he made a series of large-scale paintings, which would occupy him for the next 20 years of his life. The surrounding landscape offered many suitable motifs for Monet's work. The home and the gardens were opened only in 1980 for visitors. The gardens are showing the beauty of nature, the house contains his collection of Japanese woodcut prints. 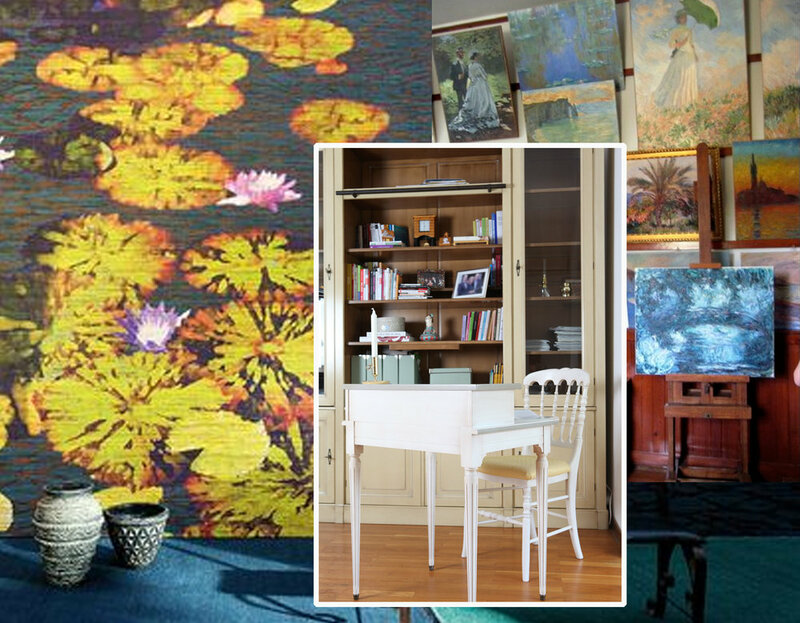 It can be to much to decorate every wall in your living room with paintings, but an office, your studio or a library are rooms where you can go a bit further than what you would do in the rest of the house. You don't have a collection of paintings? No problem there are a lot of wallpapers which will give you the idea as sitting in the garden of Monet's house in Giverny. 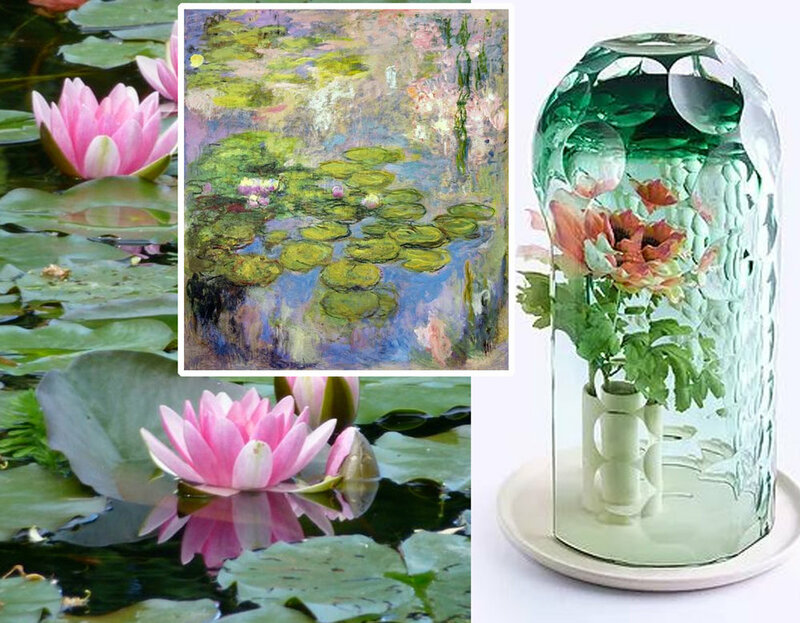 Monet and Giverny, the garden as well as the house, can be a great inspiration for decorating your home. Think of what attracts you when sitting in the garden, walking in the forests, or an exotic garden. The different green tones in a botanical garden, the delicate lines of spring flowers, or the power of a wild flower garden? And lets see now how we can translate that and have this feeling in your home. One of the rooms which can be, in general, a bit more romantic is the bedroom. Always important to have a balance in the house: not to masculin, not to feminine. I can image that not every man wants floral wallpaper in the living but they easily accept it in the bedroom. You want the bedroom more serene, walls painted in soft pastel tones, or neutrals? Why not looking for a fine printed or embroidered bedlinen. White water lilies local to France were planted in Monet's garden in Giverny along with imported cultivars from South America and Egypt, resulting in a range of colors going from yellow to bleu and white turning into pink. The shimmering of the light on the water was an inspiration for Monet in developing his specific style. When you see Bilge Nur Saltik's installation Amplify, where the light reflects on the wall through the hand-blown and carved glass you can imagine also the water reflecting the trees, sky and flowers around in Monet's paintings. Bilge Nur Saltik works with traditional craftsmen, using their age-old techniques and knowledge, and introducing new materials and fabrication processes. This intersection produces unexpected results and never-seen-before products. She creates an optical illusion with her OP-vases, a collection of hand-blown and carved glass vases. Showing the flowers through the cut glass, it multiplies the beauty of nature in a poetic way. Impressive flower bouquets can change the look of a room in an instant, following the season. There is something for each style: impressive floral arrangements for a classical style, a simple bouquet as taken out of the garden, till a simple composition which even a minimalist can enjoy. Creating a bohemian look with an impressive floral wallpaper, some vintage pieces of furniture to give your room, or house an artistic look. Maybe it will inspire you to be creative but for sure it will bring you every day joy. Imagine having breakfast in the morning in this room. An easy way to change the look of the living room is to add a set of pillows. They are easy to be changed as soon another season arrives and will give a color touch to your room. So, ready to give your home a fresh new look without investing to much? Enjoy spring at home, even on a rainy day.